Get Ahead with Full Transparency! Maybe you need to ensure that your company meets compliance guidelines or want to do some analysis about document usage and access? With DocuWare, it’s easy! With new auditing features, you can always see what’s going on in your DocuWare system. The current Version 7 of DocuWare contains a new component for auditing and tracking information. This provides you with full transparency about what is happening in your DocuWare system. Be it at the document, file cabinet, organizational or system level – with the appropriate authorization, you can see, for example, who changed which settings or when they stored specific documents. You can even see who deleted a document and when. All Audit Reports can be downloaded in universal CSV format and used for evaluations in many programs. For example, the following tasks are tracked along with the date, time and user: store, index change with old and new value, display, print, annotate, etc. You open the document Audit Reports in Web Client via the context menu of the document, for example within the result list. The menu item is called History. To do this, you need to have the new file cabinet right Show document history for the corresponding file cabinet. This right is not included in any of the predefined profiles. 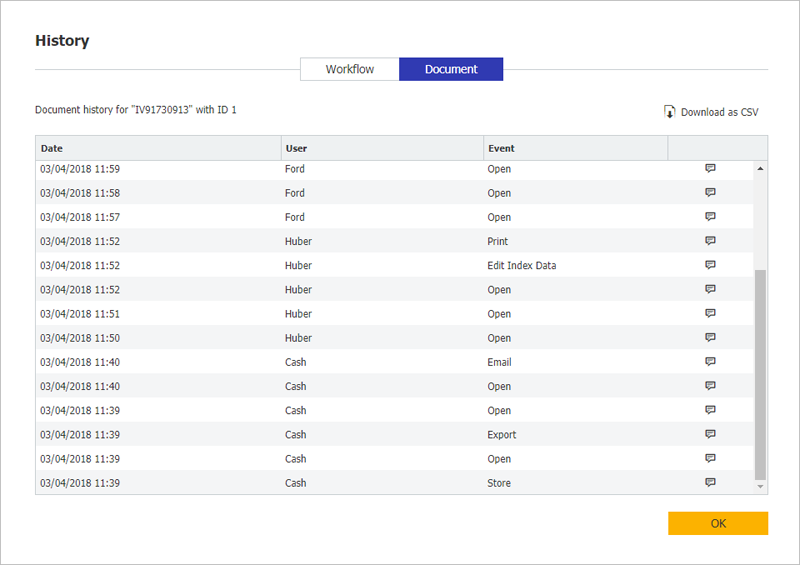 File cabinet: New index fields, changes to search and store dialogs as well as result lists, new file cabinet profiles, etc. Also all document events within the file cabinet. Organization: New configurations and changes to existing configurations, user login and logout (disabled by default). System: Changes to server settings, changes to schedules for automatic processes such as transfer, deletion policies, synchronization. Audit Reports for file cabinet, organization, and system are called up within DocuWare Configuration, in the General section. You must have administrator rights at the respective level. Audit Reports are available with DocuWare Version 7 and higher and do not require an additional license. More information about DocuWare Version 7.